President Moon Jae-in’s “urgent plea” to U.S. President Donald Trump to support limited and minor sanctions relief that affects the lives of North Korean citizens is bringing results as Trump signaled he remains open to an incremental deal with North Korea. “We are discussing certain humanitarian things right now and I am okay with that, to be honest, and you have to be okay with that. South Korea is doing certain things to help out with food and various things with North Korea,” Trump told reporters at the start of a bilateral meeting with President Moon in the Oval Office, early on April 12 (KST). U.S. Secretary of State Mike Pompeo met recently with the head of the U.N. food agency and discussed possible ways for providing relevant assistance. Pyongyang is running short on food and oil reserves that wouldn’t last for a year, reports said. North Korea’s ambassador to the U.N. Kim Song sent letters to international organizations last month appealing for food donations. But he said Washington has no imminent plans for easing economic sanctions on the impoverished North Korea. “We want sanctions to remain in place,” Trump said, stressing it’s “not the right time” for discussions of the possibility for an early reopening of frozen inter-Korean economic projects in the North such as the Gaeseong Industrial Complex and tourism to Mount Geumgang. Now, the ball has been passed to the South Korean court as President Moon is asked to persuade North Korean leader Kim Jong-un to return to the nuclear dialogue with detailed and concrete nuclear disarmament plans, before Trump’s “strategic patience” on sanctions is over. In a press briefing hours before President Moon’s departure to South Korea, Chung Eui-yong, head of the presidential National Security Council, told reporters the President told Trump about South Korea’s plan to hold another inter-Korean summit “soon” as a way to revive the momentum for talks between Washington and Pyongyang. Another senior presidential aide direct with the situation said Friday the leaders of the two countries agreed on a consensus to further embrace the risks of “personal diplomacy” or “top-down rapprochement” in advancing negotiations over nuclear disarmament. “Seoul officials will soon begin contacting their North Korean counterparts as a necessary groundwork to make another inter-Korean summit happens,” he said. Trump emphasized his administration still prefers to strike a “big deal.” The big deal is the North has to get rid of its nuclear arsenal, fully and verifiably, a condition which the North has been opposing. 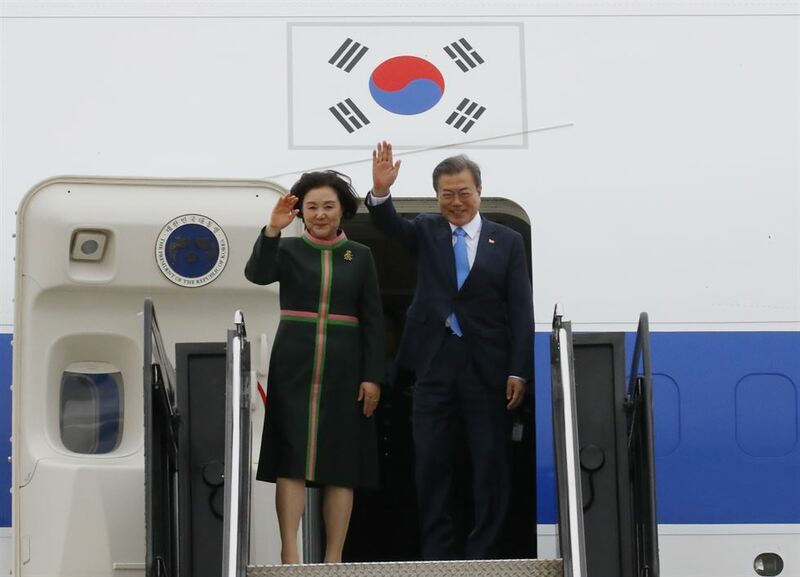 Political analysts in Seoul said President Moon would send a special envoy to North Korea to deliver Trump’s undisclosed messages to the North Korean leader hoping to get advanced and detailed measures from him toward dismantling his regime’s nuclear program. North Korea earlier presented its plans to entirely disband its major Yongbyon nuclear complex, but the U.S. demanded more and Trump ended his talks with Kim with no progress made at their second in-person meeting late February in Hanoi. Since the failure of the Hanoi summit, no high-level dialogues between Washington and Pyongyang have been held. Trump declined to say whether he has been in contact with Kim over the last two months. Regarding Trump’s remarks on the possibility of a third summit between Washington and Pyongyang, the presidential aide said President Moon shared such an idea with Trump “specifically and thoroughly on multiple fronts.” But he didn’t elaborate further. President Moon officially invited Trump to visit Seoul. Trump is planning to make trips to Tokyo and Osaka in May and June this year for a ceremony marking the changing of the emperor, as well as the G20 Summit, where he will hold a summit with Japanese Prime Minister Shinzo Abe.